Store and transport oval trays for your large parties and banquets with this Lakeside 8580 aluminum oval tray cart! It holds up to (10) 22" x 26 7/8" trays with an ample 6" of space between ledges. 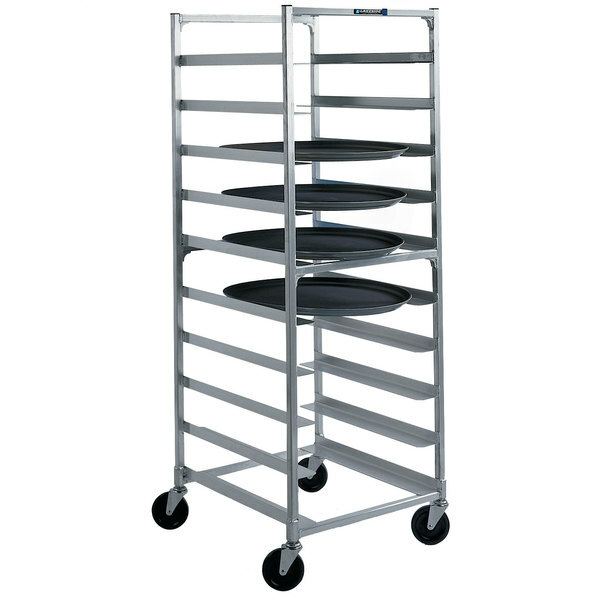 The open design allows this cart to be loaded on one side and unloaded from the other for maximum efficiency and is useful for air-drying trays after cleaning. The standard, 3 1/4" wide ledges are designed to keep your trays in place, level, and steady during transport. For additional support, extra gussets are welded in all corners of the tray cart to prevent alignment racking and distortion. Continuous 1" heliarc welds add strength in areas vulnerable to stress. Built for long-lasting durability, this aluminum oval tray cart makes a smart and efficient addition to your food service facility. For exceptional mobility, this unit features 5" swivel stem mount casters.